Broman Falls is a two part waterfall measuring 7 metres (22 feet) in height and 1 metre (3 feet) in width. 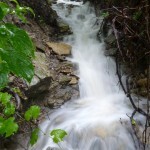 It experiences water flow only in the spring and after a heavy rain. Broman Falls was named after the park located close by – Matt Broman park. The park was named after Matt Broman (1895 to 1989) who was a prominent landscape architect in Hamilton. 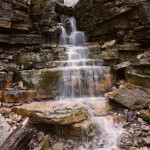 Broman Falls is located on the east side of the Escarpment Rail Trail approximately 200 meters past the bridge for Mountain Brow Blvd. To reach it park in the Bernie Arbor Stadium parking lot that is located off of Mohawk Road just before Mountain Brow Blvd. Walk towards the entrance of the parking lot and you will find a path on your right taking you to the Escarpment Rail Trail. Follow the path to the rail trail and turn left. Continue on the rail trail about 200 m past the bridge. You will find a wooden fence or lookout over a small creek. This creek drains the ditches on both sides of the rail trail. 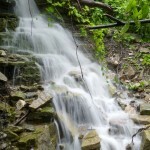 There are two parts to this waterfall – an upper cascade section and a lower drop section.